B.Com Financial Accounting is an undergraduate commerce course that lasts for a duration of 3 years. The candidates who are willing to take this course must possess minimum eligibility by obtaining 55% in their 10+2 as commerce as a major discipline or any equivalent. The average course fee charged for this course is between INR 1 to 3 lac for the span of 3 years. Admission process of this course is carried out based on the candidate’s performance in their high school exams. Some institutes may include their entrance exam score. Those entrance tests may include various quantitative tests. The candidates must have good grounding in financial analysis, creative thinking and should possess good communicative and interpersonal skills. The candidate must also have some knowledge in corporative systems and be aware of all the tax and other financial laws regulating in their industry. The candidates can also get employed in areas likeEducational Institutes, Banking sectors, Financial agencies, audit offices, stock exchanges, etc. They also provide different job types like Accounts assistant, Business assist, Marketing analyst, financial analyst, security analyst, etc. Top Recruiting Companies Educational institutes, Banking sectors, Financial agencies, audit offices, stock exchanges, etc. Job Positions Accounts assistant, Business assist, Marketing analyst, financial analyst, security analyst, Operations Manager, corporate analyst, etc. B.Com Financial Accounting: What is it about? This course lies under commerce domain. Financial accountancy is a field of accountancy concerned with thee preparation of financial statements for decision makers, like stakeholders, suppliers, banks, government agencies, owners and other stakeholders. This course is fully career oriented in nature. This course will benefit the candidates with the career options like becoming the finance controller, treasurer, finance officer, credit and cash manager, risk manager etc. this also help in maintaining and understanding the treasury of the company or the organization. The good experienced candidates form this field has higher demand from international market, and can also start with their own financial consultancies. The candidates who have completed their higher education that is 10+2 with science as their major discipline with at last minimum aggregate marks obtained in their exams are eligible for this course. Some institutions consider the score in the entrance tests based on the subjects covered and may consider that scores also. On Successful completion the candidates are capable of working in the field of Educational institutes, Banking sectors, Financial agencies, audit offices, stock exchanges, etc. 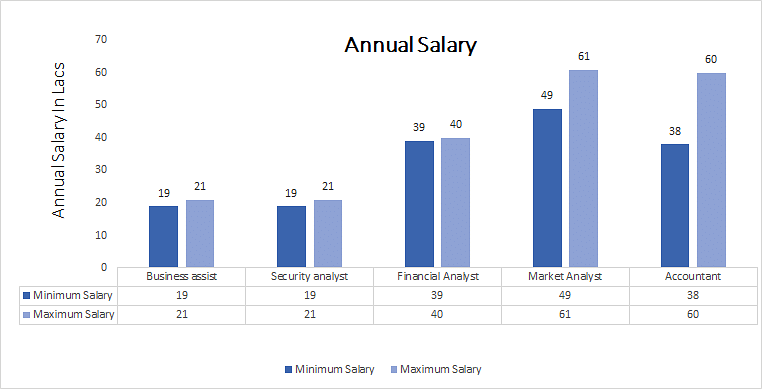 Where there are different kinds of job positions available like Accounts assistant, Business assist, Marketing analyst, financial analyst, security analyst, Operations Manager, corporate analyst, operation Manager, securities analyst, investment analyst, seni0r accountant etc.